The Southern Museum of Flight’s Elizabeth Grady is preparing for the Bombshell Celebration for Women in Aviation Aug. 26 benefitting the Mary Alice Beatty Scholarship for women in aviation. Photo by Drew Burke Photography. When Elizabeth Grady joined the Southern Museum of Flight staff in 2012, a small plaque tucked away in her new office space caught her eye. It mentioned Mary Alice Beatty, who, Grady would learn, created the museum 50 years ago. But the museum was not paying homage to the early aviatrix who founded it. “There was no mention of this woman besides this tiny plaque on the wall,” said Grady, events manager for the museum. The curiosity that plaque sparked in Grady and the information she found when she researched Beatty led the museum to celebrate not just its matriarch, but the history of women in aviation. 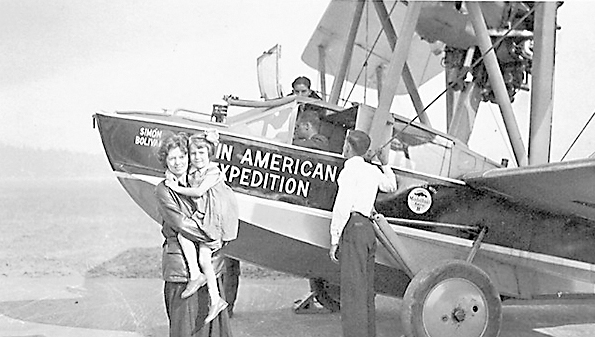 Museum founder and female aviator Mary Alice Beatty, holding her daughter Mary Alice Carmichael. Photo courtesy of the Southern Museum of Flight. for women in aviation fields. The path to those opportunities was not an easy one in Beatty’s time. Grady said she found in researching Beatty that she had taken an active role in the aviation career of her husband, Donald. The couple took many trips in the early 1930s and ‘40s through Central and South America and were the first aviation couple to fly over the Andes Mountains. Beatty was one of the first women in the state to learn how to pilot a plane, which Grady said was kept quiet because of social standards for women at the time. 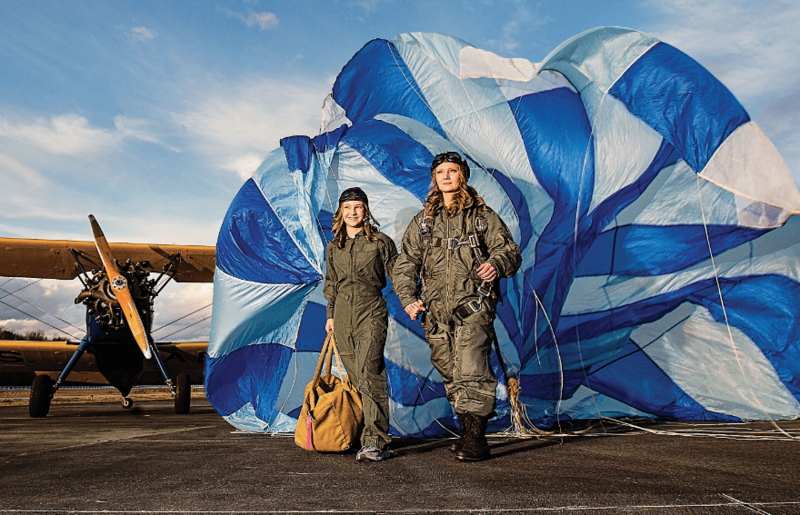 In an effort to connect to other women in aviation-based careers, Beatty formed a group called Aviatrix. She and her husband also forged connections with other aviation officials in the community to create a group that would later become the Birmingham Air Club. In the mid-1960s, a civic committee planning the centennial celebration of Birmingham charged Beatty with creating a regional air museum that celebrated local aviation history. She was given $400 to complete the project. Using her own collection of artifacts gathered during her husband’s aviation career, Beatty created six display cases that made up the Birmingham Museum of Aviation. It was housed at Samford University, then named Howard University. Over the course of 50 years, those six display cases evolved into an entire museum showcasing the South’s aviation history. Grady said there are a plethora of aviation-based career paths, from engineering to management. Schools are helping push these careers, including Auburn University’s Aviation Center, but the studies don’t come cheap. To help young women debating whether to pursue an aviation education, the museum began the Beatty scholarship, which is coordinated with help from Beatty’s daughter, Mary Alice Carmichael. The scholarship awards $5,000 each year to a woman aged 19 to 30 who is pursuing a career in aviation. Last year, the first recipient was Jordan Gardner, who used the funds to participate in executive management training for a position with the Department of Transportation. 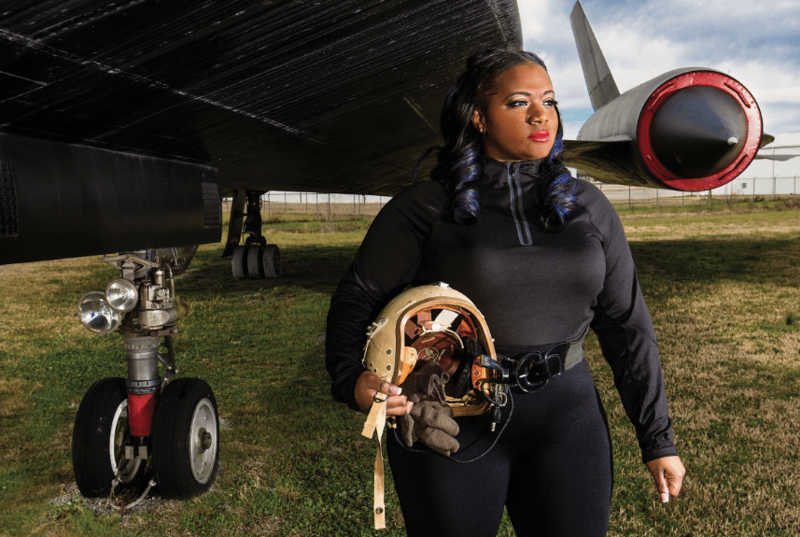 To help raise funds for the scholarship, the museum will serve as the venue for its second annual women-centric event, newly dubbed the Bombshell Celebration for Women in Aviation. Guests are encouraged, but not required, to don 1940s military dress and USO fashion. “It certainly isn’t required that guests dress up, but it’s fun,” Grady said. “The costumes can be anything from the era, whether it’s a 1940s tea dress, fatigues or a military uniform.” She found her costume for last year’s event at the AA Army Surplus Store in Leeds. The evening will begin at 6 p.m., featuring a silent auction alongside a variety of themed performances by Ladies Night Out!, a dance lesson by Steel City Swing and live music by Old Fashioned Rhythm Method. The highlight of the evening, according to Grady, will be the reveal of a 2016-2017 Bombshell Calendar (preview below), produced by Drew Burke and Melissa Shannon of Birmingham Pinups with help from designer Colin Nekritz. “With the calendar, we wanted to create something that was a marketing piece for sure, but also brings awareness,” Grady said. Harkening back to the classic definition of a bombshell, the calendar models have been dressed in their 1940s pinup best. To signify the evolution of the term, Grady said, the museum hand-picked a group of powerful women in the Birmingham community who serve as role models for young women. Leading the Bombshells is calendar sponsor Coquette Barnes, TWA former flight attendant, and committee members Courtney Sanak, Rebecca Caine, Jessica Lynn and Sarah Nichole Lowery. A tribute to B-25 WASP pilots includes Melissa Shannon, Moxie Fontaine, Kelly Henderson and Taylor Dyer. Months will also feature Jessica Garner, Jess Devine Gifts; Alison Page, Aero Joe; Chelsea Grace Sloan; Cassandra “Comedienne Joy” King, Dining out with Comedienne Joy; Sara Powell; Andrea Lindenberg, Talk 99.5 Birmingham’s Real Talk; Kayla Funk, Open Hands Overflowing Hearts; Tiffany Huynh; Dana and Wedy Rose; and ABC 33/40 Talk of Alabama’s Nicole Allshouse, Ebony Hall and Erica Lembo. The calendars are $20 and will be sold at the event. Guests also have the option of buying a calendar online with their $30 ticket purchase. For more information, visit southernmuseumofflight.org.